UFC president Dana White is one man not willing to cross over into camp Floyd Mayweather ahead of the sporting event of the year due to take place on August 26. This despite Connor McGregor never having set foot in a competitive boxing ring in his entire life – until now. This lack of experience is the driving force behind the doubt held by many in the run-up to the big stand-off. 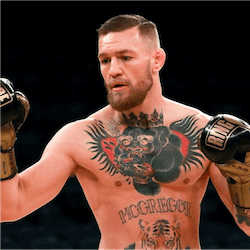 Several of McGregor’s fellow martial-artists have expressed outright concern at the possibility of McGregor not only coming away second-best, but also coming away at all. White is having none of it, seemingly confident that McGregor will be able to finish off the arrogant tax evader that is Floyd Mayweather with a single blow of the left hand. McGregor’s trademark left hand has been the topic of much discussion in the months leading up to the fight. White believes that it is the Irishman’s unorthodox approach to Boxing and fighting in general that will see him reign victorious on August 26. He also expects that the psychological advantage of McGregor’s being all of an inch taller than Mayweather will have a greater effect than anticipated. 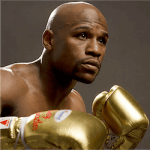 This is an idea that isn’t as exotic as it may seem at first, especially when taking into account Mayweather’s display of insecurity that pushed him to an all-time low of wearing platformed sneakers to a promotional press-conference earlier this month. McGregor took notice – and so did all of America. Meanwhile, Abi Clarke, Mayweather’s secret girlfriend – turning out to be not such a big secret after all – has reported being harassed by McGregor’s die-hard fans at her home in Essex, England. Clarke had witnessed a brick flying through one of the windows of her home, with a derogatory note attached to it. The note reportedly contained the “F-ck the Mayweathers” chant, a favourite among McGregor fans. Clarke also reported having been accosted by a trio of McGregor fans in the street, accusing her of being a “lefty loosey” and issuing stern warnings that Mayweather was going to die. This greatly unsettled Clarke who, according to her friends, now fears for Mayweather’s as well as her own physical safety and apparently suffered a severe panic attack shortly after the unsavoury incident. Clarke has reportedly said that no amount of intimidation was going to keep her from supporting her man ring-side in the T-Mobile arena on August 26. 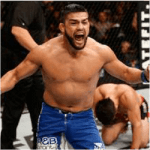 UFC Fight Night 122 Not Equally Kind To Everyone UFC Fight Night 122 delivered quite a number of surprises, including the knockout of former middleweight champion Michael Bisping in the very first round of the main event. 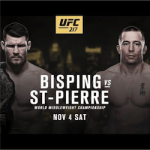 The result is Bisping having suffered a back-to-back loss for the first time …. Joe Rogan Slams UFC Main Event Fans are hyped and ready for UFC 217 and it’s not long to go now until November 5th. This despite Joe Rogan claiming that the tickets to the events aren’t selling very well at all. 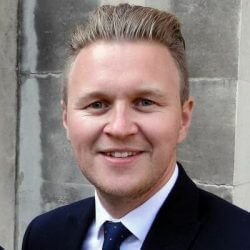 If this is in fact the case it will …. 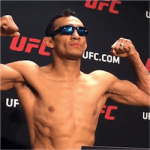 Keeping The Dream Alive Tony Ferguson has managed to keep the dream of beating Conor McGregor alive by defeating Kevin Lee by submission during the MMA fight of the year on Saturday. The win afforded Ferguson the title of interim lightweight champion. McGregor is currently still the official lightweight champion …. Dreaming The Impossible Into Being It’s official: Conor McGregor will be squaring it off with Floyd Mayweather Jr. on August 26. Rumours of a possible fight have been staved off by the powers that be for months leading up to the announcement. UFC president Dana White was even famously quoted ….